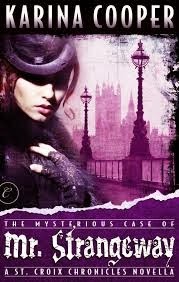 I had not realized The Mysterious Case of Mr. Strangeway by Karina Cooper was a novella until I started reading it. Not that it mattered. It is the prequel to an existing series by the author, featuring Cherry St. Croix, a collector, or bounty hunter, if you prefer. Fifteen year old Cherry St. Croix has led a varied life. An orphan by all accounts, once living on the streets of Victorian England, who is now being raised as a lady intended to one day inherit her parents' fortune. She feels like a prisoner, having no control over her life. Bored and in need of her own pocket money, Cherry decides to become a collector. Her first case involves finding Mr. Strangeway, a man who has built up considerable debt. What should have been an easy catch, soon turns into a wild chase involving a conspiracy, murder, and domestic terrorists. It was an intriguing story with interesting characters living in an alternate reality that is gritty and somewhat dark. I really came to like Cherry and all her eccentricities. She has a way of finding trouble, but somehow always manages to land on her feet. Given her past, she's extremely adaptable and resourceful, qualities I imagine would do her good in her job. The world building in this novella was believable and well done. The steampunk elements flowed naturally in the story and the world Karina Cooper has created. I liked author's writing style and the voice she's given Cherry St. Croix. I will definitely be seeking out more by this author. You can learn more about Karina Cooper and her books on the author's website. 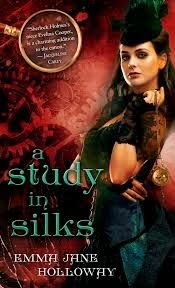 A Study in Silks is the first book in the Baskerville Affair trilogy set in Victorian England. Written in a streampunk style, the novel is a mix of mystery and fantasy with a dash of romance. When Evelina is called upon to look at a body in a closet, she is drawn into a murder mystery. She feels it is up to her to get to the bottom of the crime in order to protect her friend and her friend's family. Putting to use her own natural magical powers and the logic her famous uncle taught her, she sets out to find the truth. I am always hesitant to read books featuring characters related to well known figures in history, whether fictional or factual. So, reading about a fictional niece of Sherlock Holmes gave me pause. Still, the story line intrigued me. I am glad I took a chance on this one. Benedict Cumberbatch will forever be Sherlock Holmes for me after having seen him take on the role, and it was his face I saw and voice I heard each time Holmes made an appearance in the book. Evelina is an endearing character, with a past that makes her all the more interesting. She is a proper lady in just about every respect, except when she's not. She lives in a time period in which her true natural abilities could land her in a pyre. I really came to like her, even if I questioned her taste in men. Still, I have to say the two men who competed for Evelina's attention (yes, there's a love triangle), are both extremely interesting and I can see the attraction (although I am more partial to one than the other). I liked the attention to detail the author gave each of the characters and the world she created for the novel. She really brought the alternative world alive for me, and I appreciated the depth of her characters, including the minor ones. I felt the novel got off to a slow start. I worried that it would get bogged down by the political goings on the more the author delved into the control over the country the Steam Barons had over England. Instead, I was happily surprised at how well the author interwove that thread of the story in with the other story threads. For all the twists and turns, the novel could have been a tangled mess, but, instead, I found it quite entertaining and easy to follow. I was drawn into Holloway's world, both the magic and the historical aspects of the story. By the time I finished the book, I was surprised to learn it was 531 pages long. It didn't feel like that by the end. I am looking forward to reading the second and third books in the trilogy. You can learn more about Emma Jane Holloway and her books on the author's website. I had heard nothing but great things about this book, and although I ended up giving the first two books in the series as gifts to a friend one year, I am only just now getting around to reading the series. I am utterly in love! Right from the start the author sets the tone of the book, along with introducing her main character, Alexia Tarabotti. Alexia is so proper . . . and blunt. So different from Evelina from A Study in Silks, who was more gentile and diplomatic. Not to say one character is better than the other--just that I appreciate the differences between the two. Gail Carriger is such a good writer, staying in character throughout the book, even through the love scenes. This book was both humorous and dark. I liked the interplay between characters, both major and minor. I knew little about this book going in and was treated to twists I didn't see coming, which is always a bonus. This was such a fun read all around. I definitely am looking forward to reading more in the series and by this author. You can learn more about Gail Carriger and her books on the author's website. I really liked Soulless and just haven't carried on with the rest of the series. These other two sound good, too! I will have to check them out. Kelly - I can't tell you how many series I've really liked but have only read one or two books in . . . I keep meaning to go back, but with so many books out there to read, it can be hard. My non-reading husband has read and enjoyed steampunk but I'm hesitant - I just don't think it's for me. Kathy - I am not sure he would like Carriger's book, but he might like the other two, particularly the Cherry St. Croix series. I don't know if you would like them, to be honest. Given you are not a fan of fantasy. Not a genre I've read. The books of this genre nearly all have covers that I really like and I worry that I might actually prefer these to the actual stories. Tracy - The covers are attractive, aren't they? I do enjoy fantasy, including urban fantasy and paranormal romance, so it's not too much of a stretch for me to find myself wanting to read these types of books as well. I have yet to try steampunk, being anchored on ground by other books.They do seem like good adventure reading. Harvee - They are fun reads. I don't care for steampunk when the books get too technical, but these had a nice mix of cross genres and the world's were easy to get into. I do enjoy good Steampunk and these look worthwhile. I have Soulless and can't wait to read it. A Study in Silks looks very good too. Great post! Naida - I don't know why I waited so long to read Soulless. I am looking forward to reading the rest of the series. I've been hearing mixed thoughts on the rest of the Baskerville Affair novels, so I'm a little nervous going into the second one. Hopefully I will like it as much as I liked the first! Oh you have been on a roll! I'm like you, I'm always a bit hesitant to try books which feature well-known characters.. Probably why I haven't gotten into all those Jane Austen re-tellings! Anyway, really enjoyed reading your reviews. 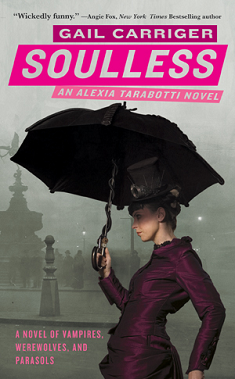 I so want to read Soulless. That one has been on my list for a while. Iliana - I feel like I have been on a roll. :-) I haven't tried any of the Jane Austen re-tellings either, although some of the recent ones have been tempting, especially with other bloggers singing their praises. I hope you do get a chance to read Soulless at some point. It's really good! Samantha - I have a feeling I'm going to continue loving the series as I go. I really like the main character and her love interest. Not to mention Carriger's writing.